It’s just as well that both Iron Fist and Luke Cage got the axe. These shows were dragging their feet to get our heroes where they need to be as Power Man and Iron Fist. If the cancellation of their individual series means we finally get to see a Netflix show with the aforementioned title, I’m all for it… if not, then maybe we’ll see a proper version of the show that fans wanted on the Disney streaming service in a few years. If the rights to these heroes finally revert back to Disney, fans might even get to see the duo in an MCU flick. Now that Disney is getting all the mutants back from Fox, I look forward to the day when Power Man and Iron Fist can square off against Sabretooth and the Constrictor… just like in the old comics of my collection. Although Sabretooth often tussles with Wolverine, he first appeared as an Iron Fist villain back in 1977. I’d also be all for a Heroes for Hire series. We could see the Daughters of the Dragon — Misty Knight and Colleen Wing — join Power Man and Iron Fist as series regulars. Throughout both seasons of Luke Cage and Iron Fist, highlights for the viewers have always been when any of these characters team up. Misty and Colleen had a great moment fighting side by side in the pool hall during Season 2 of Luke Cage. Fans also rejoiced when Luke and Danny fought back-to-back and comboed a spectacular special attack during the warehouse brawl that same season. Imagine how happy fans would be to see them together on a regular basis. If these Netflix heroes revert to Disney, it could mean an even more impressive roster for a Heroes for Hire show. Our heroes could be joined by the likes of White Tiger, Shang-Chi and Tarantula. That would make for one of the most diverse casts of heroes on a superhero show. As a bonus, you could have guest appearances from Ghost Rider, Hercules, She-Hulk and The Human Torch — all of whom have been members of the team at one time or another. I can’t say I’m surprised that these shows weren’t renewed. Iron Fist was the weakest of the programs and I’m amazed that it received a second season. It could have turned things around had it tried. First off, Iron Fist should have been featured in his signature costume right off the bat. Fans were delighted when Daredevil sported his iconic outfit in his second season. Secondly, the show should have turned to one of the first two volumes of the recent comic: The Immortal Iron Fist. For those who are new to the character, I highly recommend both graphic novels. Ed Brubaker did an incredible job crafting an interesting Iron Fist story. The first graphic novel introduces former Iron Fist, Orson Randall. This guy is so cool that people might want an Iron Fist show featuring him instead of Danny Rand. Regardless, he becomes sort of a mentor to Danny and shows him some neat things to do with his chi energy besides making his fist glow. Randall should have shown up at the beginning of the season, instead of being teased at the end. Option two for Season 2 should have been to follow the second graphic novel: The Seven Capital Cities of Heaven. This is another opportunity to finally explore K’un-Lun and learn that there are other cities beyond our realm. Better yet, these cities have each selected their champions to fight in a tournament. If Danny was going to fight Davos in Season 2 anyway, you might as well raise the stakes. Besides, who doesn’t like watching a martial arts tournament? Much like Mortal Kombat, The Quest, Bloodsport and Enter the Dragon, you can have movies that feature some tension, drama and intrigue between all the matches against the colorful cast of characters. “Colorful” those champions certainly are. While Iron Fist fought the Bride of Nine Spiders in Season 1 — she had the look, but not the demeanor of the comic character — she could return as a contender or for a rematch. We’d also be introduced to the likes of Dog Brother #1, Tiger’s Beautiful Daughter, The Prince of Orphans and everyone’s favorite: Fat Cobra. It would be worth it just to meet him. But even if the tournament isn’t your speed, there’s some political intrigue going down during all this between Lei Kung the Thunderer (who trained Danny and Davos) and Yu-Ti, who runs the city. If that sounds more interesting that Season 2 of Iron Fist, it’s because it is. Season 2 of Luke Cage wasn’t as dynamite as it could’ve been, either. It was slow to get going and I sure didn’t appreciate the manufactured drama to get Claire Temple outta his life. It’d have been one thing if Jessica Jones showed up not long after, but I’m still waiting for the two of them to become the couple they are in the comics. Fortunately, Season 3 of Jessica Jones is filming, so a Luke Cage cameo isn’t out of the question. Viewers probably wouldn’t mind forgetting the insufferable place where Season 2 of Luke Cage ended. While I appreciate the homage to The Godfather in how the scene was shot, I don’t think it’s at all in keeping with Luke Cage’s character. It felt shoehorned in and an excuse to keep the focus on the Harlem’s Paradise club. 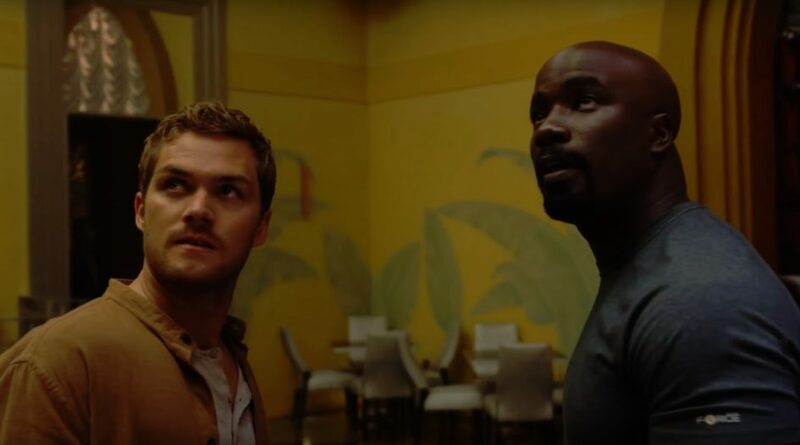 While it’s a cool-looking location, it’s just one more thing keeping Luke Cage from setting up Heroes for Hire with Danny Rand. So, in my opinion, the cancellation of these two shows brings us closer to what fans really want to see: Power Man and Iron Fist, together in a regular series.